Located in the beautiful Susquehanna River Valley, the town of Selinsgrove, Pennsylvania, is a safe community with shops and restaurants you can walk to from campus. Enjoy the rich culture of major cities like New York, Philadelphia, Baltimore, and Washington, DC, within just three hours and have easy access to major airports and rail stations for travel. 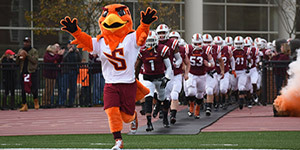 Type of SCHOOL: Founded in 1858, Susquehanna University is a selective four-year residential college that educates students in the liberal arts and sciences and provides them with real-world professional experiences, preparing them for a lifetime of personal and professional success. 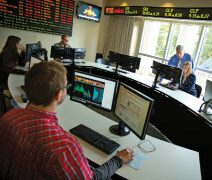 Colleges, programs, and degrees: The AACSB-accredited Sigmund Weis School of Business and the School of Arts and Sciences offer undergraduate degrees in more than 100 majors and minors. In collaboration with Columbia University, Susquehanna offers a 3-2 Engineering and Applied Science program. International student services: International students receive support from our Office of Global Programs. We also offer intensive English preparation through our English Language Learners program. Financial aid: Susquehanna considers all admitted international applicants for partial merit scholarship awards based on academic achievement and test scores. Need-based financial aid is not available for international students. Test score requirements: If English is not your first language: TOEFL—80 (internet based) or IELTS (minimum 6.0) or Cambridge English (minimum 170) or PTE Academic (minimum 53); ACT (minimum 19 in English) and/or SAT (minimum 450 in Critical Reading) scores accepted in lieu of TOEFL/IELTS/Cambridge/PTE Academic; English Language Learners program and conditional admission are available. You are an exceptional student—expand your global horizons and study in the US! In our evolving global community, the only constant is change. Anticipating what your future will hold is complicated, but finding the right path to get there doesn’t have to be. At Susquehanna University, we focus on helping you develop the skills you need to succeed in your personaland professional lives. You will be academically challenged, socially engaged, mentally prepared, and ready to succeed in a global economy. 90% of Susquehanna students complete one or more internships, conduct research, or student teachbefore graduating. With more than 100 majors and minors available from our School of Arts and Sciences and the AACSB-accredited Sigmund Weis School of Business, including Business, Accounting, Finance, Engineering, andPre-med advising, you can easily combine your talents and interests with your career aspirations. Attending college in the United States is a sound investment in your future, and you want to choose wisely. 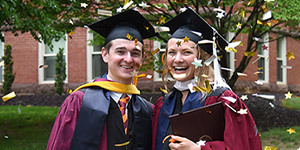 No matter your major or career plans, you will graduate from Susquehanna University with the broad-based academic foundation and the essential job skills—critical-thinking, writing, teamwork, and communication skills—that employers and graduate schools seek. 98% of Susquehanna graduates are employed or pursuing advanced degrees within six months of graduation. What makes the academic experience at Susquehanna distinctive? Small class sizes and a student-facultyratio of 13:1. Close interactions withfaculty who serve as academic advisors, research collaborators, and lifelong mentors. Strong employment, graduate, and professional school acceptance rates after graduation. And a strong alumni support network. At Susquehanna, we understand the value of cultural competence. We are one of only a handful of universities in the United States that require allstudents to complete an off-campus learning experience in a new culture—our award-winning and nationally recognized GO (Global Opportunities) program—and reflect uponthat experience when they return. Seeing how different social and cultural forces shape the world around us creates a campus learning environment that embraces diverse perspectives and experiences. If English is not your first language,our English Language Learners program can help you prepare for a successful college career. In addition to intensive English preparation,Susquehanna will help you make aseamless transition into Universitydegree programs and allow you to participate in all the cultural, recreational, and social experiences the University has to offer. The Sigmund Weis School of Business is in the top 5% of Business programs worldwide due to our AACSB accreditation. Other AACSB schools includeHarvard Business School, the University of Pennsylvania’s Wharton School, Peking University in Beijing, National University of Singapore, and the Indian School of Business in Andhra Pradesh. About one-third of our Accounting majors have job offers before they begin their senior year, and 100% are employed within six months of graduation. Alumni from renowned companies such as Goldman Sachs, Prudential, Fidelity, JPMorgan Chase, and Merck & Co. visit campus regularly to judge student presentations, speak as guest lecturers, and seek out prospective interns and employees. In conjunction with Columbia University, Susquehanna offers a cooperative program in Engineering and Applied Science. Students spend three years at Susquehanna taking courses for a major in Physics, Mathematics, or Computer Science and Pre-engineeringfoundation courses prescribed by Columbia University. Approved candidates enroll at Columbia for two years, earning both a bachelor’s in Mathematics, Physics, or Computer Sciencefrom Susquehanna and an Engineering degree from Columbia. Located in Selinsgrove, Pennsylvania, close to the cities of New York,Philadelphia, and Washington, DC, Susquehanna University is near the beautiful Susquehanna River. Selinsgrove is one of many small, safe communities in the area. On-campus student housing is guaranteed for all four years. Thefirst-year and sophomore residence halls are pleasant and spacious. Upperclass students live in contemporary apartments and townhouses at the same cost as first-year and sophomore housing. Travel to and from Susquehanna is easy! We offer pickup services for students at the Harrisburg InternationalAirport, and we have transportation to major airports in New York City,Philadelphia, and Washington, DC.